As always "reproduce what you are actually seeing"
Tip: Sketch in hair to fill the area, then use a tortillion to blend them all out. Then use the pencil to add more hair. This will give the illusion that there is depth and many layers of hair. Pay particular attention to where the eye lashes are connected to the eyelid. If you want it to look realistic you must have the hairs attach correctly. 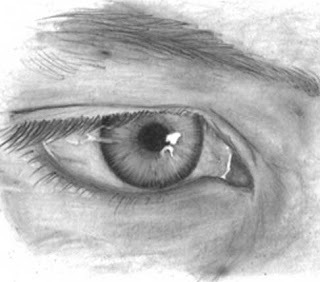 The biggest problem that I used to have with eye lashes was that I was trying to draw in three dimensions. I knew that the eye lashes came out from the eye and my mind wanted to try to recreate that. As we know, that is not possible. So, look at your original as exactly what it is, a two dimensional image. Look at the eyelashes as if they are lines going across the other areas of the eye. Then draw them exactly as you see them. The same things that I pointed out above when talking about eyebrows are important here as well. Skin is never perfect, there always freckles or other spots that define character. This is where you keep your finished image from looking like a porcelain doll. With your pencil simply draw the blemishes where you see them, then use the tortillion to smooth them out. Blending them a little bit will anchor them to the skin so that they don't just look like dots drawn on the face. All skin has wrinkles but remember that not all wrinkles look the same. In this image there were a few wrinkles under the eyes and more tinier wrinkles where the corner of the eye meets the nose. Using very light strokes with the pencil, sketch the wrinkles in. You will likely want to go over them very lightly with the tortillion just like you did with the blemishes. For the larger wrinkles you will want to look very close at your original source image. You will notice that there is a bit of reflective light along one edge of the wrinkle. Using an eraser that is sharpened to a fine point will help you get those highlights in place. Thank you so much for these lessons on drawing eyes. I took your advice and bought the Lee Hammond book as well and find it one of the most useful books available.